Home » What Is Form 1023-EZ? The IRS released Form 1023-EZ, Streamlined Application for Recognition of Exemption Under Section 501(c)(3) of the Internal Revenue Code, for use by the public on July 1, 2014. Form 1023-EZ is a new federal tax-exemption application form, specifically designed to simplify and shorten the process for small nonprofits seeking 501(c)(3) charitable status. For many years, all 501(c)(3) applicant organizations had to file Form 1023, a 28-page application, plus attachments and exhibits. It is not unusual for final filing packages of the standard Form 1023 to exceed 100 pages for many applicants. Also, wait times of 1 year or more for IRS approval were common at the time the IRS introduced Form 1023-EZ. The IRS was also sitting on a 66,000 case backlog (and growing). 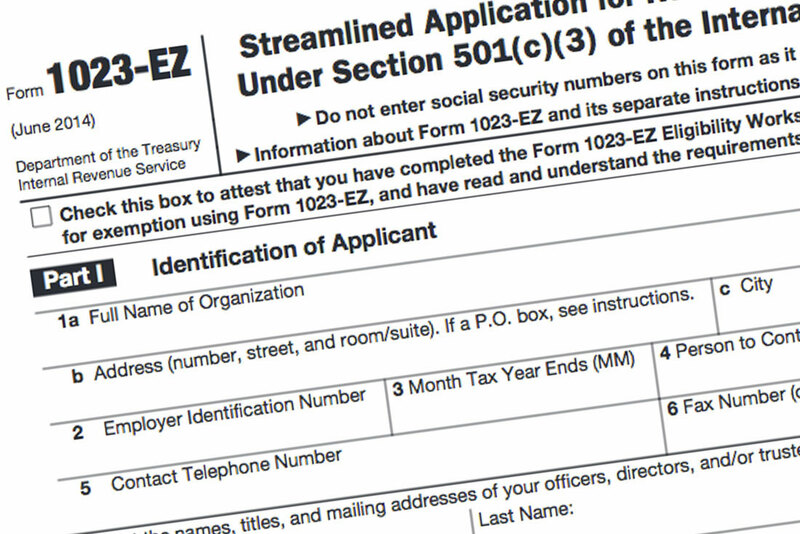 Form 1023-EZ streamlined application for 501(c)(3) status, is shorter, online only, and designed to make it simpler and faster for small nonprofits to obtain 501(c)(3) status. While the IRS still requires the applicant organization to have a proper organizational setup and a compliant purpose and activities, the process itself is certainly less burdensome on the front end. We should note that the IRS does randomly select a statistically significant percentage of applications for full, Form 1023 long-form style review. Eligibility to use the IRS streamlined process is limited by purpose, income, and other factors. In addition, many organizations that technically qualify to use Form 1023-EZ may find that the longer process is in their longer term best interest.